Cramming onto a tube train, not going anywhere, getting off again, and doing the whole thing over, might sound like just another bad day on the Northern Line. But that's one of the science experiments at University College London's PAMELA Lab. PAMELA, short for Pedestrian Accessibility Movement Environment Laboratory, is in a shed in an industrial estate in Tufnell Park. Inside, the walls are painted black, street lights hang from the ceiling and students, researchers and volunteers mingle, with eye trackers, brain monitors, circuit boards and cups of tea. 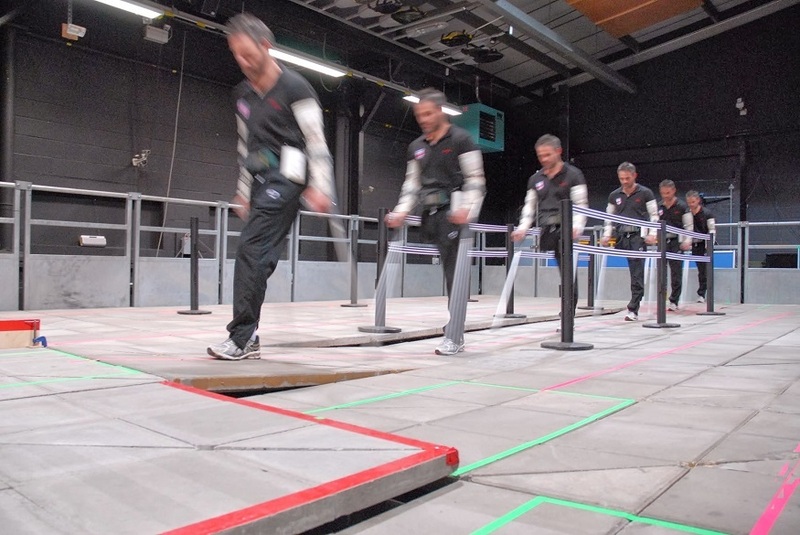 The research happens on a big concrete platform that can be adjusted to create different surfaces and conditions to test how people move. 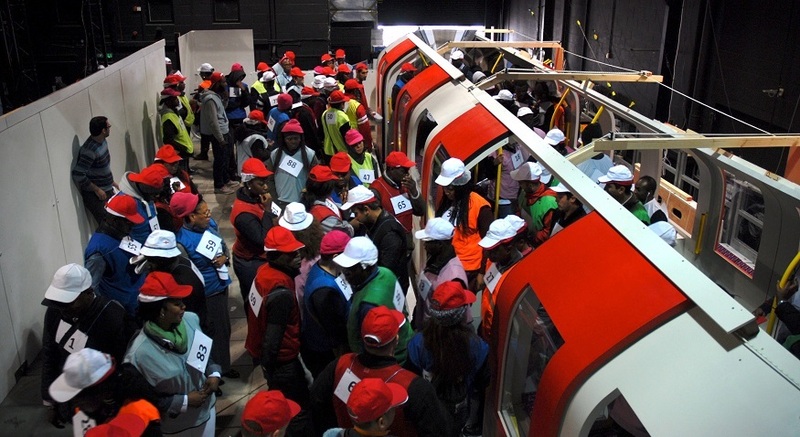 The PAMELA team work with TfL to test new designs for train carriages and platforms. Dr Catherine Holloway, director of the lab, tells us about a recent experiment to measure the effect of platform edge doors on how quickly people can get on and off a tube carriage. Platform edge doors are used on the Jubilee Line (and soon Crossrail), providing a barrier between the platform and the track. Catherine explains "the doors improve safety but increase heat in the tunnels, which means that components of the track, signalling and trains wear out faster". TfL also wanted to know if they have an impact on people getting on and off the trains, and the PAMELA experiments showed that overall the extra doors have no significant impact. Extra doors on tube platforms might not make much difference, but moving around London can be difficult if you are in a wheelchair, on crutches, sight impaired or suffering from dementia. Testing new designs and developing new technologies to help people with disabilities is what excites engineer Catherine the most. Testing the effect of different surfaces on people using crutches. Photo by UCL PAMELA. "We have equipment here to measure brain function, eye movement, and full biomechanics of people moving through different environments", says Catherine. "We can test assistive technologies here in ways that are just not possible in the outside world". For instance, PhD student Chinemelu Ezeh, is researching head controlled wheelchairs. Chi is hacking new controls into motorised wheelchairs, then measuring how well they work and what impacts they have on users' bodies. PAMELA researchers are also working with neuroscientists to get a better understanding of how people with dementia see their environment and move around. Mr Brown is a research participant with a form of dementia that has reduced his ability to understand the objects that he sees. He can see a chair, and tell you that he is looking for a place to sit, but his brain can't put the two together. Working with experts in dementia, PAMELA researchers design experiments to find out how Mr Brown sees the world, and test interventions that might help him. "Perhaps Mr Brown would know where to sit if we put a flashing light or a label on the chair," Catherine says. "In our lab we can safely test things that might help Mr Brown and others suffering from his condition". Because no London lab is complete without one, PAMELA has its own bus. Destination - Science. The bus that is also a laboratory. Photo from UCL Engineering. 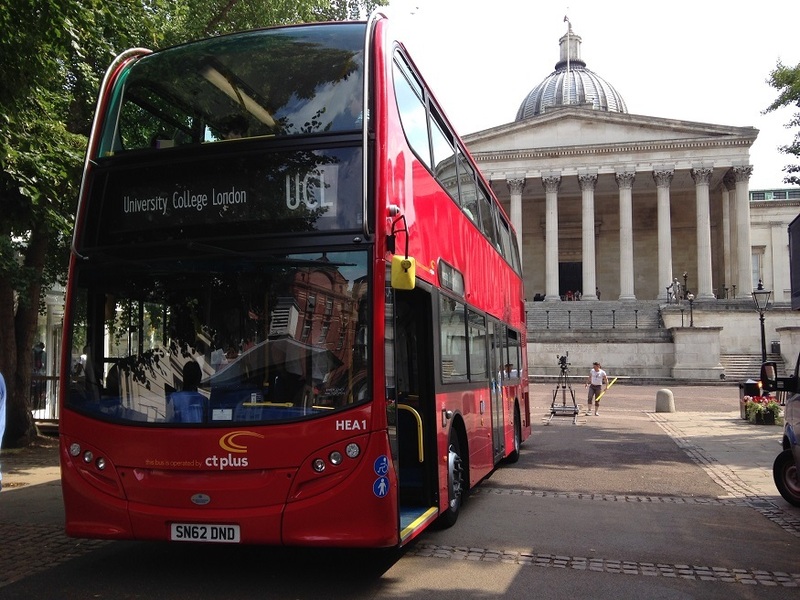 The PAMELA bus is full of instruments to measure the forces and movements of passengers getting on and off, and travelling on London buses. The bus is the focus of a collaborative project led by PAMELA artist in residence Zoe Schoenherr. Zoe is working with a visually-impaired dancer and five other artists to turn the bus into an art installation, exploring tactile experiences of places and things. Zoe's work will be ready for a public performance and exhibition at PAMELA in September and October. To keep up to date with research at PAMELA, including calls for volunteers to cram into tube carriages and announcements about Zoe's exhibition, follow them on twitter @UCLPamela, check their website or sign up to the newsletter of the UCL Department of Civil, Environmental and Geomatic Engineering.